Above is Maryfarms, a little place on the way to Mt Carbine from Mt Molloy. It was actually in the news recently because the residents were complaining that some time ago the State Government (or whoever it is who looks after official gazetted town names) dropped them from the list. They are now "informal" and only exist as a part of Mt Molloy (or maybe it was somewhere even further away). So they have started the process of appealing to the committee to be reinstated. Good luck becoming an official place again, Maryfarms. This year has seen us staying within Queensland so far, and visiting places we have been before. However, we have done things differently. 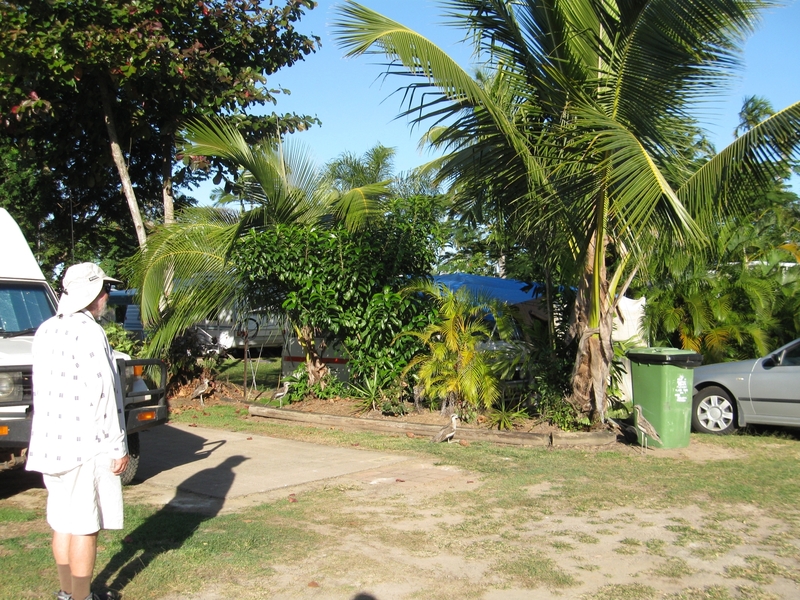 For starters, we arrived in Brisbane, were reunited with our vehicle, and then high tailed it up the coast to Cairns. We arrived in time to pick up 3 old friends (make that 3 friends we have known for many years) at the airport. Thus began a different kind of journey for us. Five people, a convoy of our 4WD and a big motorhome restricted to sealed roads, and our briefing was to spend 3 weeks visiting our favourite places. One of the nice things about having all that space is that in the evening all five of us could fit easily inside where the evening could include post dinner card playing -- away from bugs and weather and with all the comforts of home. Now we know why all those other people drag those large cavarans behind them everywhere they go. NOTE: Click on each picture to see larger version. Click the Back button to return to this page. We began our journey heading North from Cairns along the coast. This was our "shakedown" cruise so we could learn about life in the big Maui and how everything worked. Although the rental comes with a DVD covering various features of the vehicle, there is no substitute for experience. So a couple of easy travelling days saw us camping at the beach and making a foray inland to have lunch at High Falls Riverside Restaurant . We also called in at a glassworks Hoglund Glass which exists like us as migrants between New Zealand and Australia depending on the season. 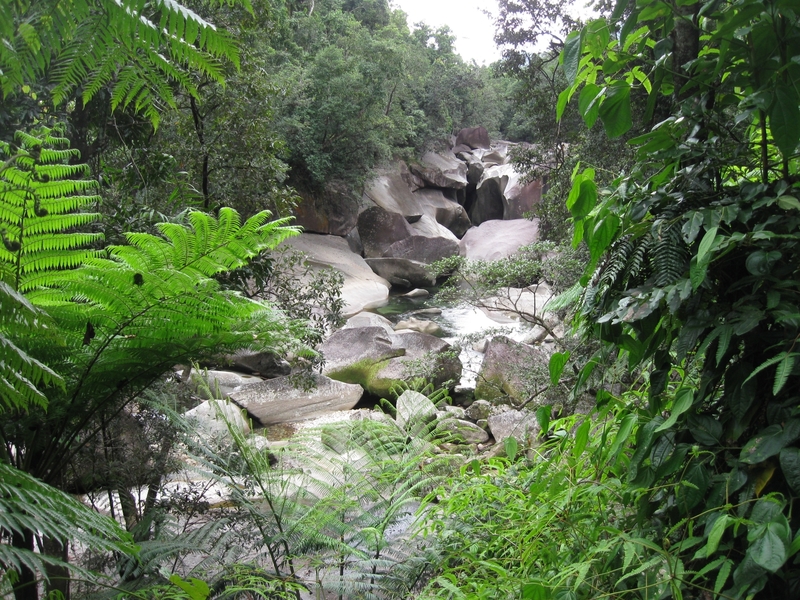 We also had a small look at Mossman Gorge. Nice, but it was only a small look because most of the real track was closed. 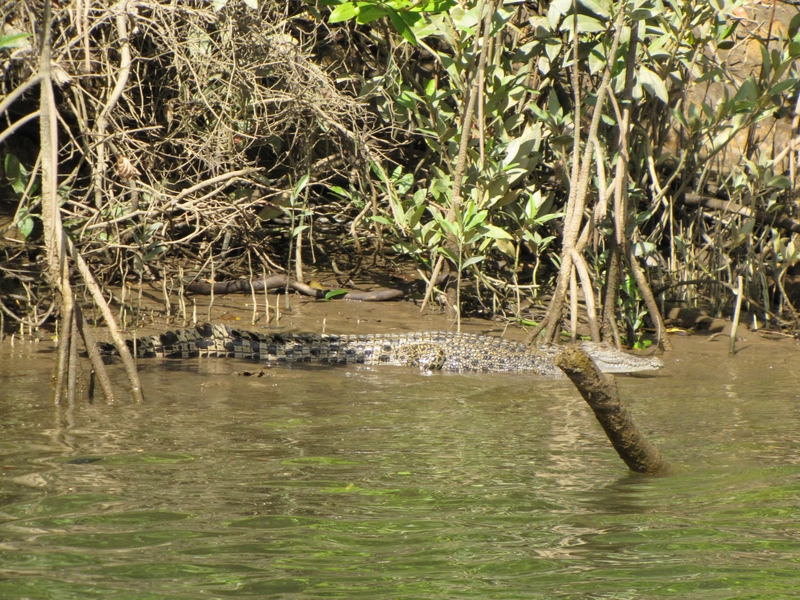 The first big "nature" stop was the obligatory boat trip on the Daintree River so we could be up close (but not too close) with Crocodiles. I guess you call this a Crocodile Snap. Going North of the Daintree River takes a car ferry trip so we paid the ferryman and headed over. The skipper who took us on the Crocodile cruise said he worked on the ferry when he first needed a job after being at sea. But since it is a cable ferry and you don't even need to steer, working on it made him bored to tears. So he's much happier to be doing cruises where he gets to steer himself. Once on the North side we drove up taking in a few of the National Park walks. Then we camped for two nights near the end of the sealed road. You can't go further North towards Cooktown unless you have a 4WD. 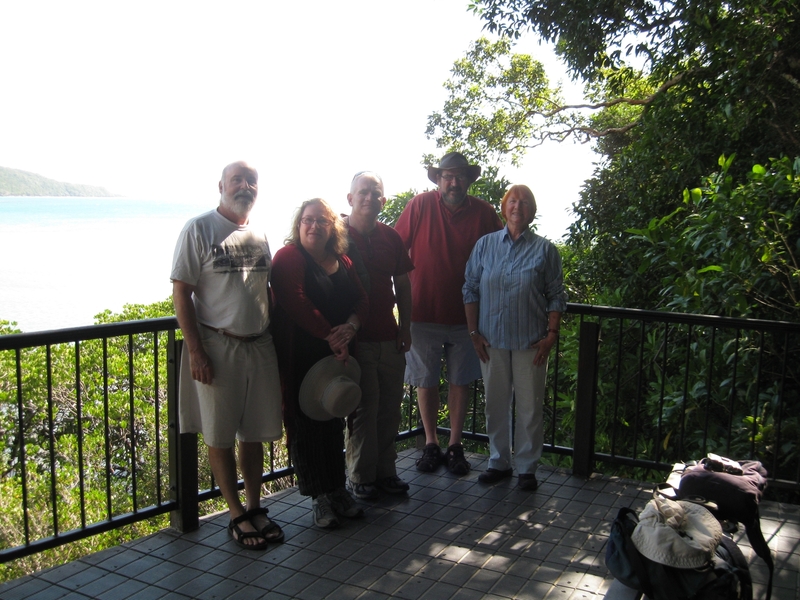 Here is a photo of our party taken at Cape Tribulation lookout. This was our turnaround point. Next we had to take the long (but sealed) way around to Cooktown. So down we went again (stopping in at a few more walk places), back across the Ferry, and then headed for Cooktown. This was a fairly long drive. The terrain quickly changes from rainforest to dry inland forest as you move inland over the mountains. Then there is a very long stretch of open woodland which has cows grazing on it and no fences. 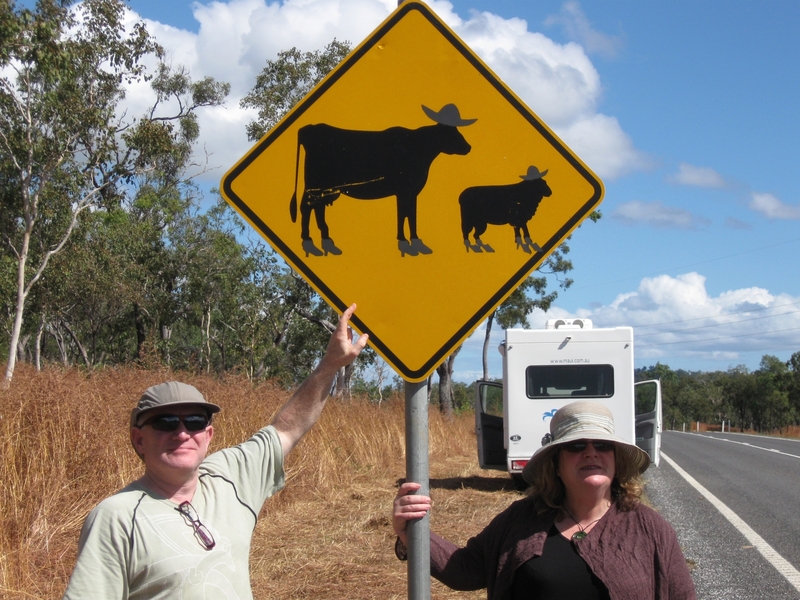 In order to keep drivers amused, the locals have "improved" some of the signs warning you about wandering stock. The other thing which we got to experience was fires close to the road (controlled burns to reduce fuel in case of "the big one") which made part of the trip memorable. This section was voted the "this is more like what we expected Australia to look like" section. There are lots of other "improved" road signs around. Somebody must have a serious committment to making the road more interesting. Oh, and there really were cows (and bulls) on the road. Not a sheep in sight on our whole trip, which isn't suprising given the environment. But I guess they use the same signs throughout the country so you get a sheep and cow. Another stop to keep us amused along the way was the historic Palmer River Roadhouse which was an oasis of cold drinks and cool indoor temperatures with lots of historical objects from gold mining days. We had two nights in Cooktown and we spent our days looking at the natural and historical sites. This seemed another obligatory stop for New Zealanders since this is where Cook hauled the Endeavour out for repairs after ending up on the reef. The town is quite small and you can walk around it in a few hours (which we did, inlcuding the Botanical gardens). Colin was keen on an ascent of Mt Cook (the Qld version) but alas the track was closed for post cyclone repairs so we settled for a walk on the level. One bump which punctuated our otherwise level stroll was Grassy Hill. This is where Captain Cook climbed to he could see if there was a way out again past the reefs. This is what he saw (although there wasn't a lighthouse or guard rail or visitor signing back then). You can make out some of the white water where bits of reef are exposed. Cook had to wait a long time for the right winds to be able to get out successfully. He must have had good distance vision as well as a lot of patience. Coming back from Cooktown to our next destination we had to go all the way back along the same long highway. We did have a detour before we got on with the long drive, on a lesser road up towards Laura. There is a nice Aboriginal rock art site up that way and we went up to have a look. It was a hot day and a hot walk, but worthwhile. On the way back to the main highway Trev had a flat tyre (or tire for some of our readers). As always, the left rear. 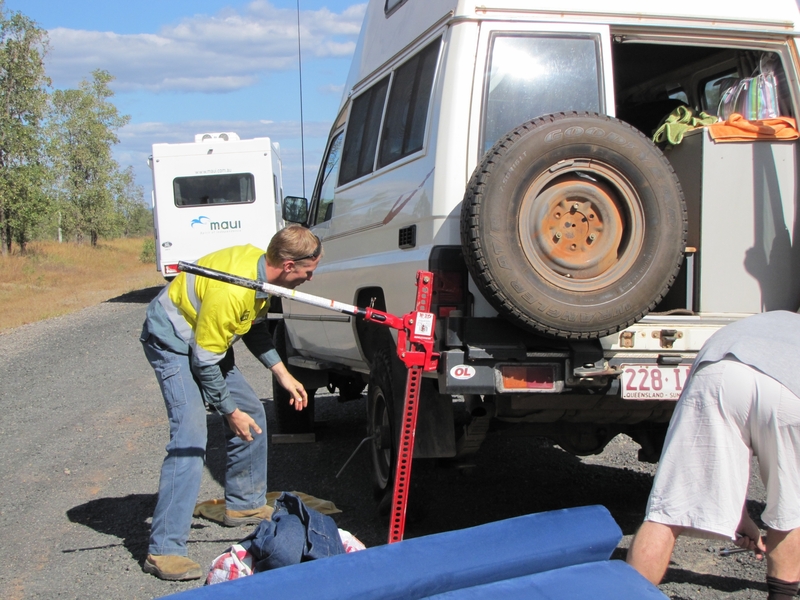 Fortunately, we were saved the lengthly process of using the little Toyota jack because a kind worker (Ergon if I remember correctly) stopped and used his High Jack. Fortunately we've got the appropriate jack points on our double swing out spare system. That's him in the standard issue high visibility shirt, and my bottom on the right as I shift something in preparation for getting the spare off. See that red dust on the spare wheel? That's what gets everywhere from travel on unsealed roads, and what you don't want to have showing at all on your "don't go off the sealed roads" Maui motorhome when you return it. So after the tyre change we were on our way again. Back along the same long stretch of highway. No fires today, but there were still cows on the road. We pulled in at a favourite camping area of ours at Mt Carbine, which we had passed on the way up to Cooktown with a promise of returning. We were given a great pair of sites where we could be close together and do our now established cooking and eathing together. In fact, we did very well on the whole trip getting adjacent sites so we could share facilities easily. 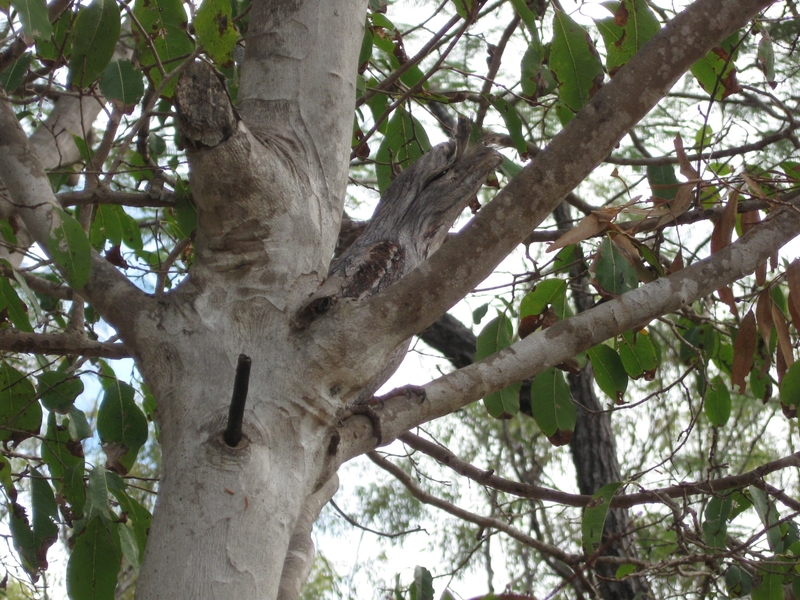 Mt Carbine is a place with lots of birds in residence, including one cryptic character called a Tawny Frogmouth. There he is sitting up in a tree trying to look like just another old broken off branch. It can take quite a time to spot one even when you know they are in a particular tree because they are so well camouflaged. They also sit incredibly still. About the most you get out of them is an eye which might open to observe you if you get too close. This goes until nightfall when they suddenly turn back into nocturnal birds who prey on insects. After an overnight stop at Mt Carbine, we had another longish trek planned out to the west. Our jumping off place this time was Mareeba and we whizzed through on our way West. 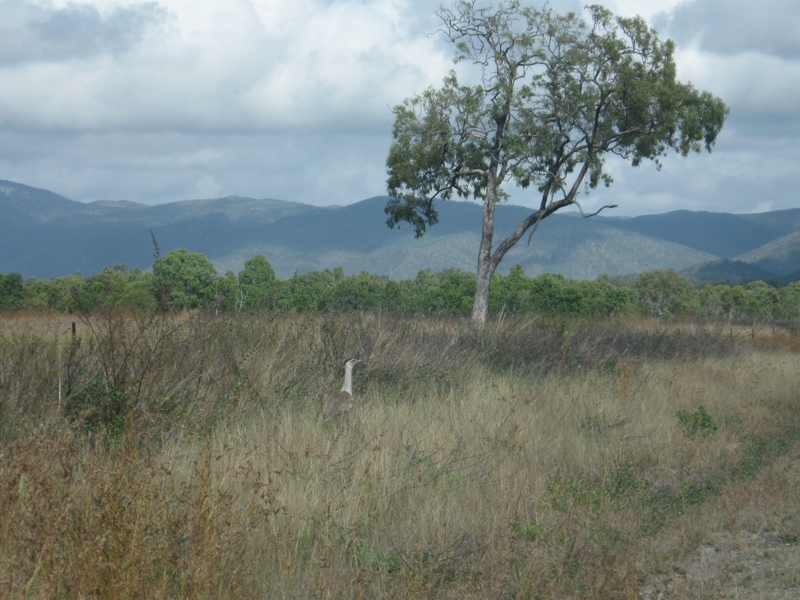 We were headed for a town with the unlikely name of Chillagoe. Chillagoe (like Mt Carbine, and most little towns in the middle of nowhere) is an old mining town, but now it is better known for its limestone caves. These are very shallow caves to be found in the patches of old coral reef which stick up above the ground level here and there. Similar formations can be found in Western Australia and I'm not sure if they represent the two edges of a great inland sea. Or they could be millions of years apart in time. Anyway, the existence of the old reefs always reminds me of Bill Bryson Down Under where he talked about the early European explorers who all seemed to carry boats with them when heading inland. They were convinced there was a great inland sea. They were right, but were just a million years too late. From Chillagoe we had to travel back to Mareeba, and this time we had a overnight stay (and general shop for fuel and supplies) at a funny little place called Granite Gorge. 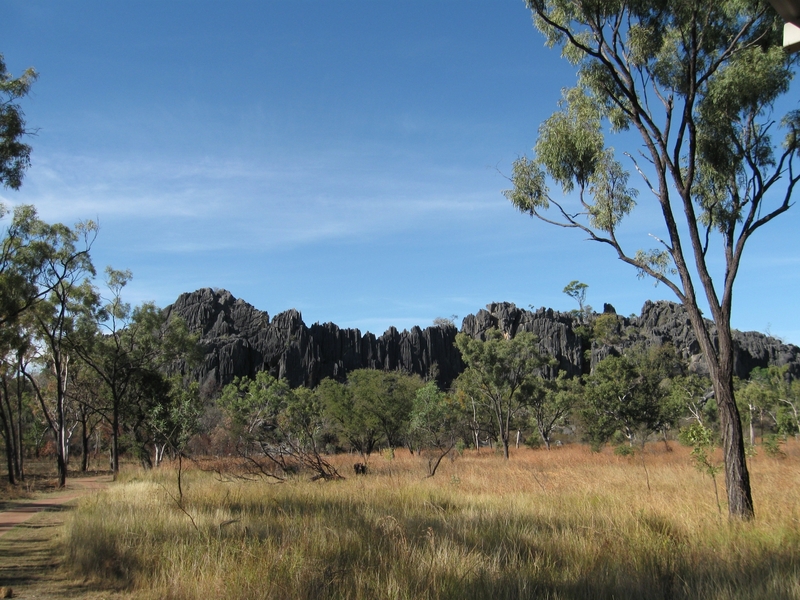 It's a private reserve located amongst a great pile of granite boulders. There is a nice walk if you can handle boulder hopping, but the unique thing it offers is a chance to get close up and personal with Mareeba Rock Wallabies. 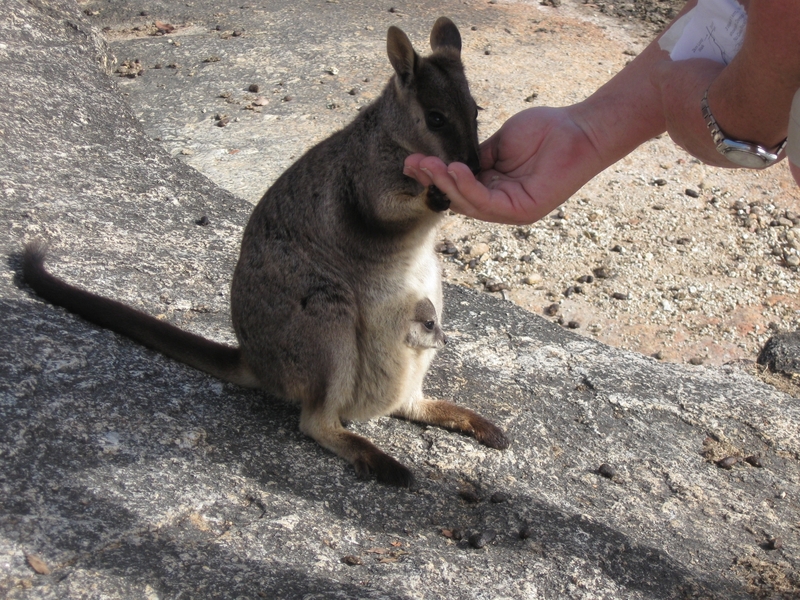 Feeding is a big no no in National Parks, but here the owners sell little bags of special Wallaby pellets and the usually shy Rock Wallabies are habituated to coming to your hand for a feed. They are tiny creatures who carry even tinier creatures on board. This female has a joey in the pouch. If you don't get your hand down low enough, or take it away too early, they use their substantial claws to let you know it -- just as some cats do. The Rock Wallaby populations in Queensland are very scattered little isolates because their preferred habitat is piles of rocks, and these only occur in patches. We headed off from Mareeba, which is quite dry, and into more rainforest areas. 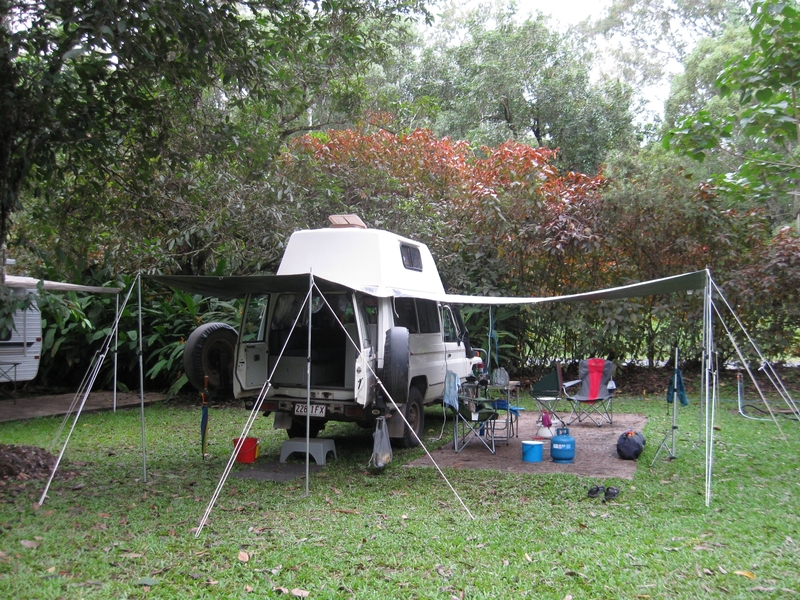 We had two nights at another funny little caravan park at Lake Eachem. This was our launching place for walks around Lake Eachem and Lake Barrine. These are a pair of crater lakes surrounded by rainforest. This is a very New Zealand kind of place, except for the leaches. We had to dispatch several which climbed aboard our legs. Yeech. But it's all part of the scene. We didn't see many birds or little animals (particularly Musky Rat-Kangaroo - one of the few little critters active in the daytime) which is a worry. We had promised them and then had no shows for our guests. Talking to a few people it seems that the two cyclones just a few years apart (Larry then Yasi) has really hit the food supply and habitat, and there has been a general loss of populations. Fortunately, we also went on a night wildlife tour and had luck seeing Lumholtz's Tree Kangaroo , Green Ringtail Possums, and Leaf-Tailed Geckos. No photos of these night dwellers, but we did get this snap of another iconic animal: Duck Billed Platypus. This put us back in the good books with our guests. Flushed with platypus success we now headed West again to Undara Lava Tubes. This is an area we hadn't been to since 2001 and we hoped that it had retained its outback charm and lovely natural features. We were happy to see that it has. We had booked on a half day guided tour and we trekked about seeing a number of different tubes and hearing about the natural history and European settlement of the area. 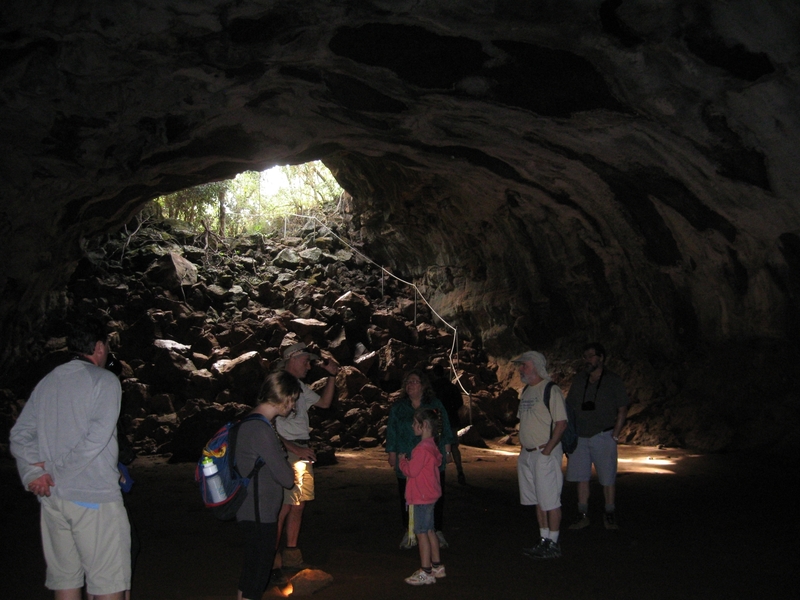 Here are are, down one of the lava tubes. You can see how there can be a bit of a scramble getting down over the fallen rocks, but our patient guide got us all there and back with all accounted for. There were a couple of families who were also on the tour with us and the young kids had to be kept in check somtimes. There are plenty of wide open spaces where kids might wander off, as shown the in composite panorama shot at the end of this photo essay. That shows the volcanoes way in the distance across the wide arid plain. You can't see any lava tubes until you happen on to them. Surprise! During our two night stay we also treated ourselves to a meal out, and listened to an excellent singer-songwriter performing by a big communal fire. Then it was time to say goodbye to the dry inland and head back to the coast...in search of a Cassowary. 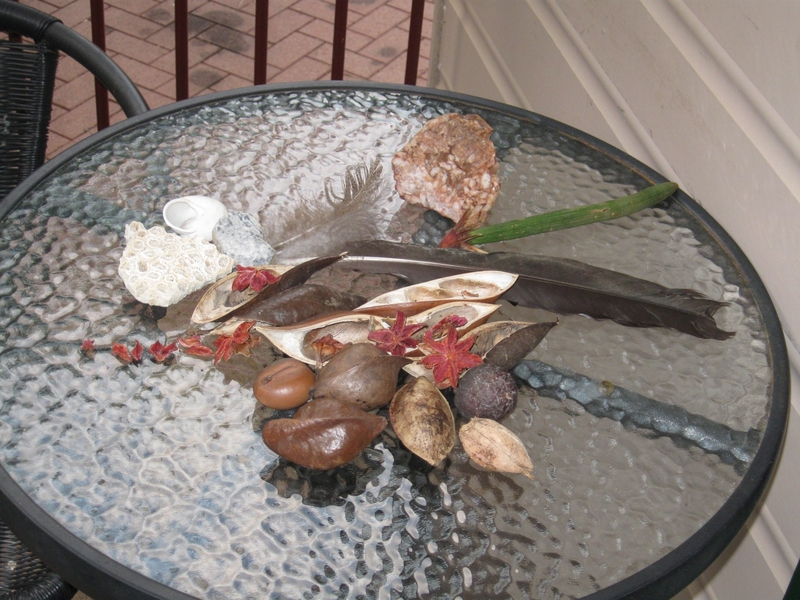 Yes, we found them at Etty Bay as you can see. We tour guides had actually checked in with Etty Bay on the way up to Cairns just to be sure that cyclone Yasi hadn't taken its toll there. 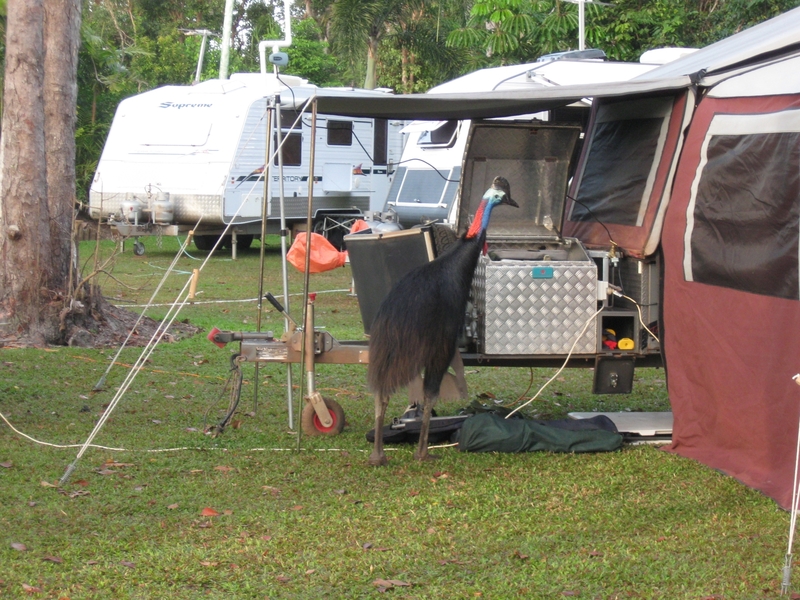 We were assured that the Cassowaries still patrolled the camping area, and so it turned out to be. Notice the Etty Bay logo on those swimming trunks, just to prove where we were. Now Etty Bay is a lovely little bay and camping is only allowed at one end where everyone is briefed about Cassowaries. But a couple of German girls travelling inexpensivly were free camping at the other end and they weren't wary. They left the back of their van open and Colin found one in the front seat cowering and the other one on the beach saying "what can we do?". A Cassowary had stuck its head in the back of the van and was consuming a loaf of bread. The anwer? Too late, you can't shoo them away and we hope the bird doesn't get a stomache ache from your foolishness. After two nights at Etty Bay camping right on the beach, we joined the longer term campers who get so used to Cassowaries cruising by that they no longer follow them down the beach with cameras clicking. Time to move on to Paronella which was our last night on the road before returning to Cairns. Jan and I have known about Paronella for years. We've passed by it and not called in on lots of occasions. On this trip we decided we (and our guests) should stop and have a look. We discovered during our preparation that they now have a very small caravan park so we booked in there well in advance. That way we got to see the park by day and by night. It was grand. And photogenic. But hard to do justice in just a few photographs. It is a grand folly in the jungle. From here on we travelled back to Cairns though ever more built up areas, until we ended up back where we started. Nearly. Unfortunately Steve went through a light just before it turned, which left Big Maui behind. This happened just at the point where the last two tricky turns had to happen to get to our caravan park. Although we had started the trip from there, the residents of the Big Maui had never approached it from this direction. We tried to flag them down as they sailed off on the wrong road. Twice. Eventually we reached them on mobile phone and eventually they were able to turn (no easy feat in Big Maui) and make it back to us. Funny that in all the time prior to this we had never really been split up like this and we really weren't ready for it. But we all got there in the end, and had a last night. Jan had time to snap this photo of Val's collection. Alas it couldn't go back to NZ. The Christchurchians were deposited at the airport for their flight the next morning, and Big Maui returned to the rental agency. Later we found that we had leftovers in the fridge which were in rental company containers, but we have yet to hear any complaints about that. 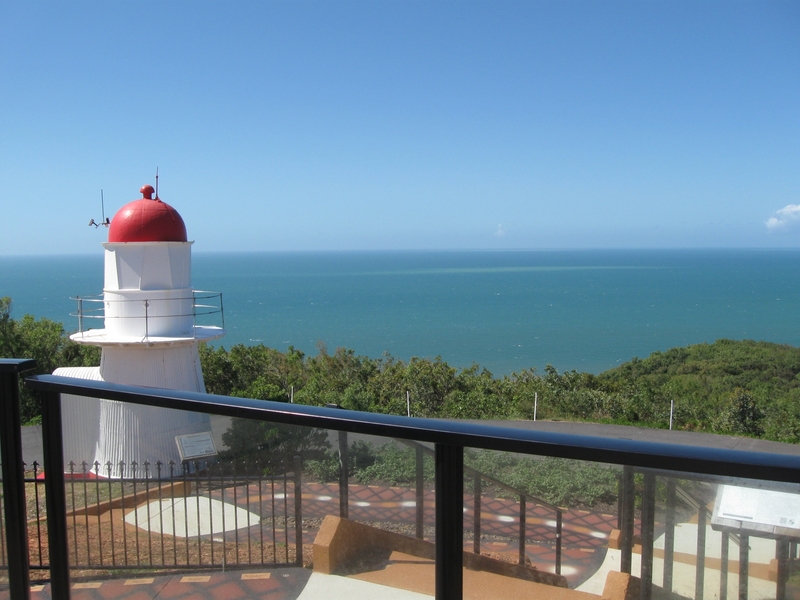 After three weeks limited to sealed roads, we were thinking about being adventuresome and heading up Cape York. But we discovered that we should have arranged our vehicle service and checkover weeks in advance. Nothing was really available, so we took a date we could get (back in Mareeba with a service place we know and trust) and then had to cool our heels in the same area until then. But from the time we were left on our own, the clouds came in and it started raining. Our Christchurch friends had great timing. There was widespread rain around much of Northern Queensland so we couldn't really escape (which is what we do when we can). So here we are under reduced circumstances, with all our awnings out to get a little extra space. After this shot it got very muddy where once there was grass, due to continued rain and 4WDs coming and going. Eventually we decided to decamp and try our luck back at Mt Carbine. And as soon as we left the mountains towards Mt Carbine we left the rain. We had been sitting an hour away from a dry area for a week! On the road to Mt Carbine we took the panorama which is at the top of this photo essay. Those were the clouds we had been sitting in the whole time. They look much better when you see them from afar! So we left Cape York out for another year. It turns out that it would have been a bit wet (the same general rain which came through the North), and there wasn't enough time left for us to get there and back to Cairns before a short break in our Australian travels while we went to the premiere of daughter Alyx's first feature film back in Auckland. Meaning another loop back to Cairns. We seem to have spent far more time in Cairns than we planned on this trip. So much for planning. But I get ahead of myself. We need more birds. This is one of Jan's favourites, a bustard. This one was prowling around in the long grass and moved away from us when we stopped the vehicle and the camera came out. Remember you can see this bigger if you click on the image, then press the back button to get back here. We almost always see bustards cruising around like this in long grass with their heads pointed slightly into the air. Putting on a superior look. For the first time ever we saw one of these guys flying and they looked huge and unfamiliar. Fortunately we were with some experienced birders who knew right away it was a flying bustard. The experienced birders we met up with were on a camp with Birds Australia North Queensland which is currently turning itself into Bird Life North Queensland (after a merger). 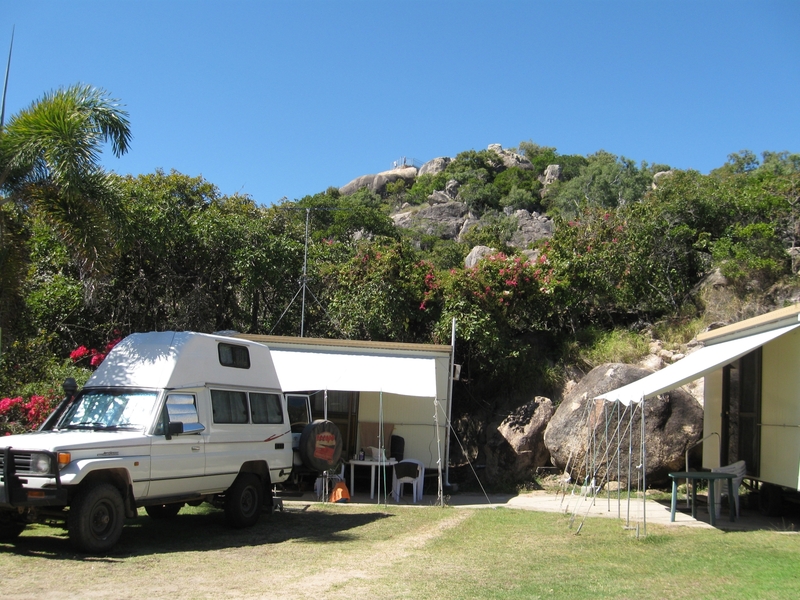 After the disappointment of timing and Cape York, we read about a Campout which was happening at Minnamoolka Station (south of Mt Garnet). Now it happens that we've been past this property twice before and the big lagoon looked really interesting so we were very interested in joining in. So we had four days camping by the lagoon. Lots of time was spent in our comfy chairs with binoculars gazing out. From the link I gave before you may be able to get to more photographs and a bird list (for the dedicated), but at time of writing the report seems to have gone offline. 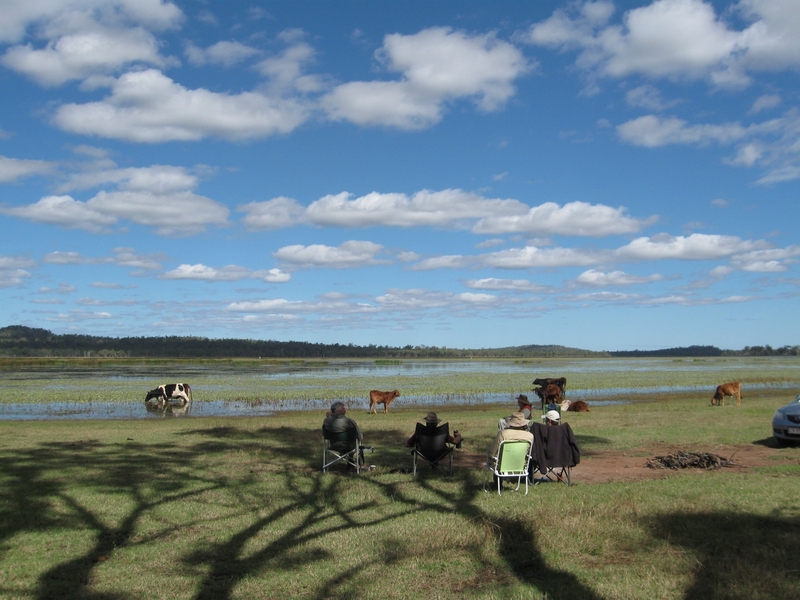 Yes we were able to observe cows as well as birds. And there was a goat which made trouble and kept on having to be moved on when it wanted to eat our chairs, tents, and clothing. After the campout we headed back to Atherton and spend a couple of nights there prior to heading for Cairns and the airport. I think we were trying to spend as little time in Cairns as possible. We left our car in covered airport parking and hopped the plane to Auckland and back. The premiere was quite an event. Here is a star and a director. There wasn't a red carpet, but there was a Red House spirit. Upon our return from Auckland to Cairns we landed, picked up our car, and drove straight out of Cairns headed South. We didn't stop until we got back to Babinda, where revisited the bakery and did our shopping at the local grocery store. Then onward to South Mission Beach. We didn't even call in at the main part of Mission Beach (it's a little overdeveloped for our liking). Both of these beaches (and Dunk Island) were pretty messed up by cyclone Yasi, and the rainforest still looks stripped of leaves. So we passed by the Cassowary Shopping Centre (oh yes they named it that) and went straight to make camp. We had a salad, went to bed at 7 PM and didn't wake until 7 AM the next day. Loss of habitat through both development and cyclone damage may partly explain why we awoke the next morning to see a Cassoway checking out all the camps for interesting food scraps. We had to hide our own rubbish bag when it came our way. It stuck its head into tents, checked out bins, and made a couple of passes through the camp. At "birdcamp" we had also heard that somehow a developer had recently managed to clear 300 acres of rainforest (another housing development) on the road out to South Mission Beach despite attempts to preserve Cassowary habitat and controls on rainforest clearance. So we were both excited to encounter a Cassowary at South Mission Beach (after all, we've been there several times and spend days hoping the see them) but worried that it might mean the last few have been forced out of the forest. 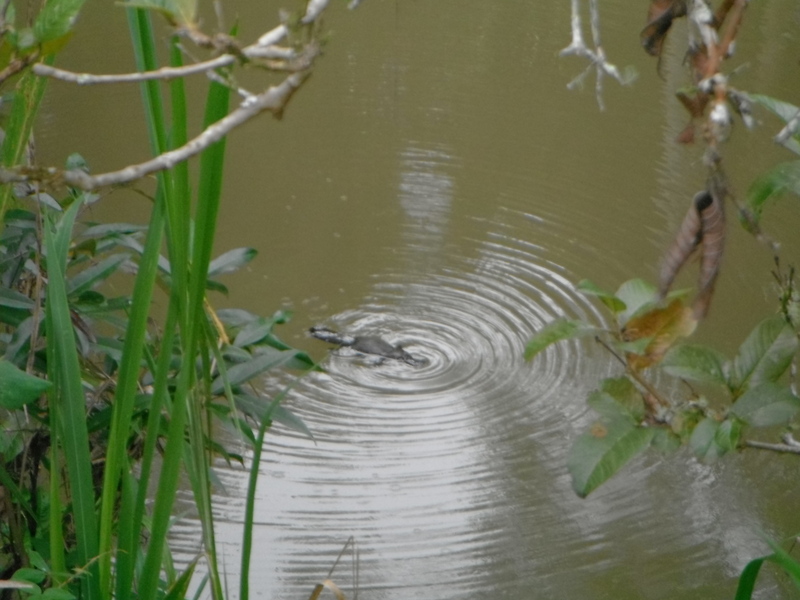 We saw two more travelling together along the road near a sugar cane plantation on the way out. 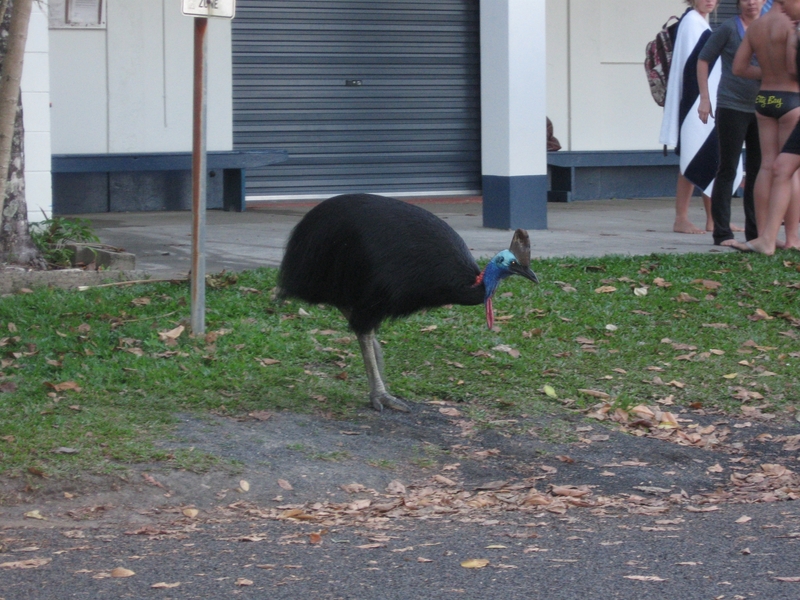 So either it's all random and we just happened to cross paths this time, or this is not a good time to be a Cassowary at Mission Beach. 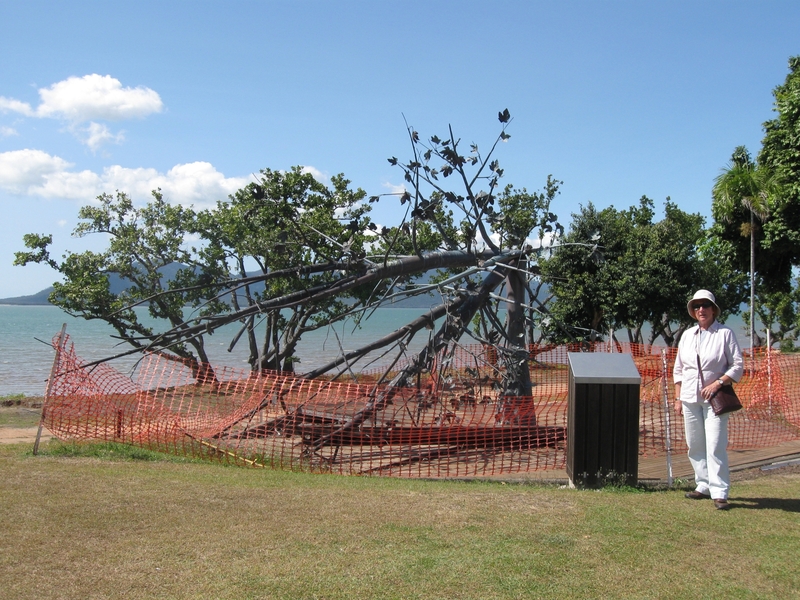 A few weeks later (where I'm writing this up in Bowen) we saw a little item on the news which was about the plight of the Mission Beach tourist industry (still not recovered), and the total destruction of Dunk Island. We were sitting across from it at South Mission Beach and had no idea. The devastation was shocking. The bush stone-curlews. They were practically underfoot. The locals told us they think that more of them have come to live right in the caravan park because after cyclone the residents of the caravan park became the main food supply. And at night they came just outside our window to serenade us, as usual. The next morning we were on our way again, heading first to visit Wallaman Falls (the tallest single drop waterfall in Queensland or Australia, I forget which exactly) for lunch. We've been there before but not for ages because getting there is a bit of a mission compared to some which are closer to the main highway. 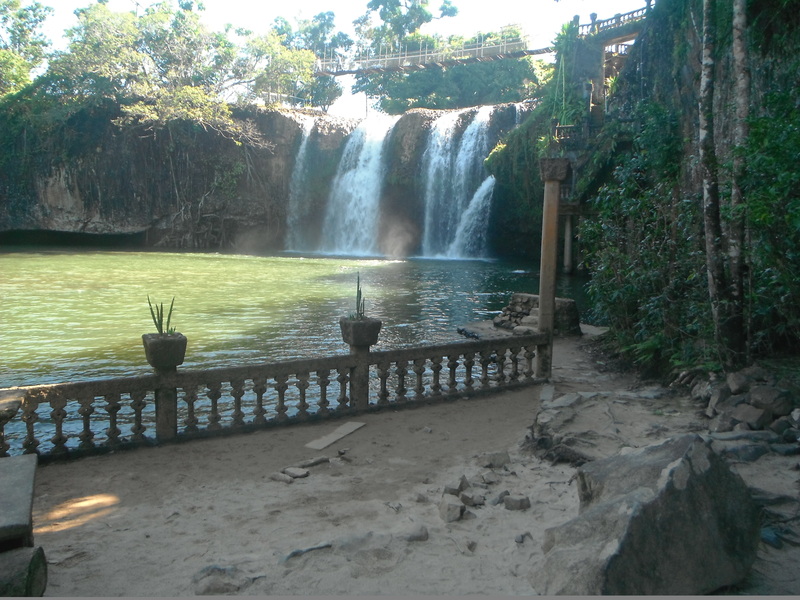 Once again we were a little disappointed to discover that the track to the bottom of the falls is closed post -- you guessed it -- Yasi. So after lunch it was on to Horseshoe Bay, Bowen where we had a two week reservation at a little cabin which was calling to us. This is being posted from Cabin 19 at Horseshoe Bay Resort. You can almost see me working away inside there as I write this. We've stayed in this cabin before , and we arrive and populate it with all the comforts of "home" out of our vehicle. Up over us you see the lookout which was closed by -- you know what -- Cyclone Yasi. It was only reopened a couple of weeks before our arrival. Shiny new metal. 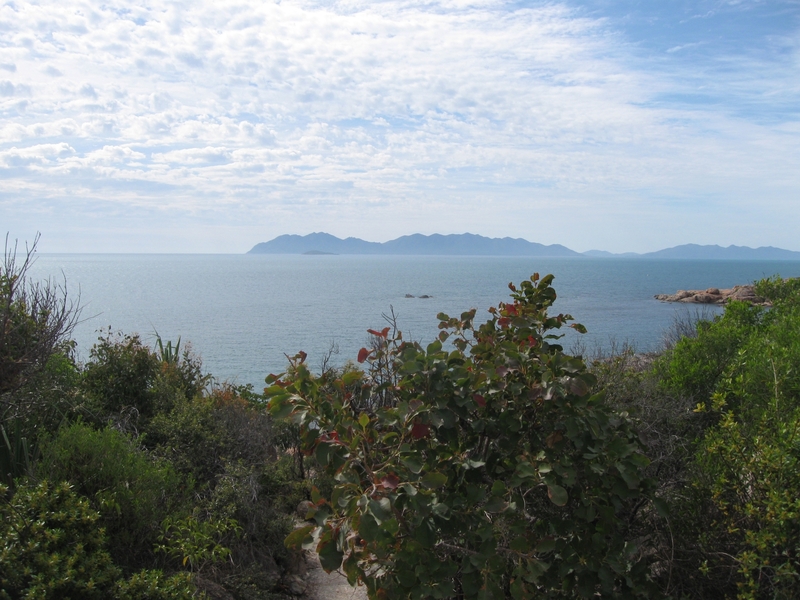 From there you can look down on our cabin, or over to the beach, or out to spot passing Humpback whales and boats. We've spotted Humpback whales several days, but not every day. When it is wash day there is laundry out drying like penants across the top of the awning and on all the ropes tying it down. But this looks like we had finished with the drying. 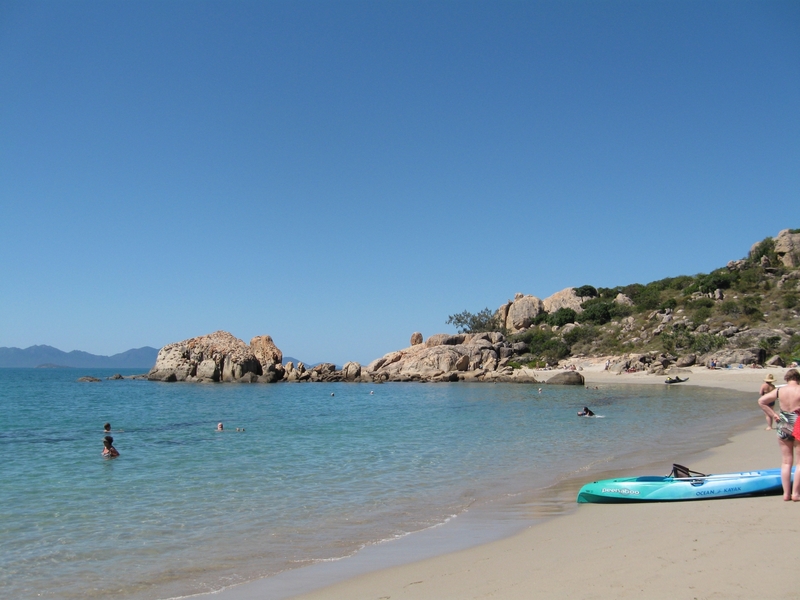 We have been taking it easy with daily swims in the ocean, and walks around the area. The weather has been just right except for a few patches of rain just in the last few days. But the usual fare is blue sky, cool overnight, hot in the sun, and the sea to cool off in just a few steps away. The author can be spotted doing just that if you look closely. In fact, it is so nice here that we decided to stay for a third week. This turned out to be a good thing because we had our car in to get the front wheel bearings repacked and the inner seals replaced, and rather than being in for a day it was a week. Work wasn't happening for all that time, it was mechanics who all got sick at the same time. After two weeks of cloudless skies, it was actually nice to have a few cloud effects over Murray Bay. This is taken on my 5-6 km daily walk from our cabin. The track winds up and down, across Murray Bay, and eventually to Rose Bay. Three lovely little bays connected by tracks (although there are roads as well). So each morning it is a walk, followed by a swim, then a shower to get the salt water off. 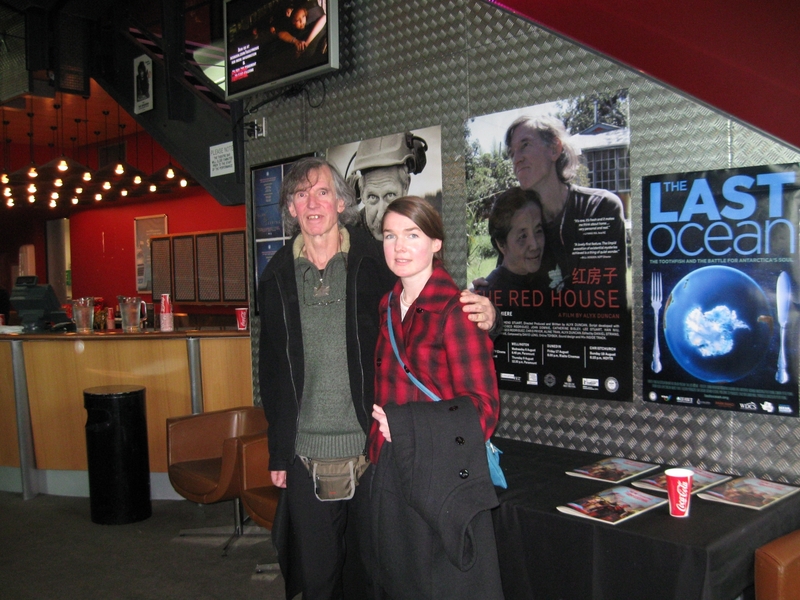 Afternoons we read, occasionally have outings, and last night we even went to see The Dresser which was shown by some sort of film society which operates here in Bowen. Before dinner we both have a smaller walk to the overlook for Murray Bay and/or to the lookout above our cabin. Thanks to Walt, Colin, and Val for sharing part of our trip with us and teaching us to play all sorts of card games we didn't know. I've also pinched a couple of your photos. But all the typos are my own work. I'll fix them in the next iteration. Next up is a trek to Bowra (out of Cunnamulla) which is a birding place we've enjoyed before. That's five days travel, and when we get we probably won't have any internet or mobile phone coverage. We'll see if things have improved since we were last there. Below is an Undara Panorama to finish this dispatch.